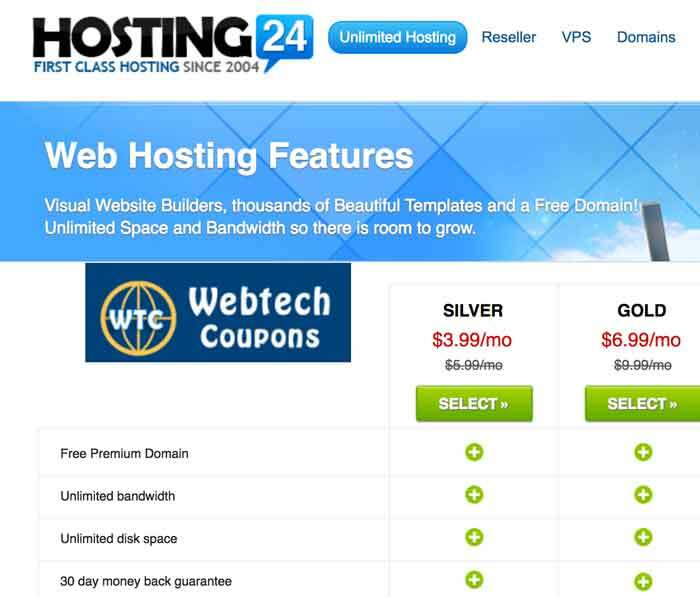 Hosting24 brought one of the exciting web hosting offers for all users around the world. Here you can get unlimited web hosting for just $3.99 per month. The original price of web hosting is $5.99, but you will get it on low 33% off for just $3.99. In this web hosting, you will get the unlimited resource. The hosting is one of the best Shared Web Hosting packages from Hosting24 where you can run static & Dynamic website both. This package has some extra feature compare to silver hosting. You can add domains, means you can run multiple websites in a single web hosting. Why buy Shared Hosting from Hosting24? Hosting24 is providing its service in hosting since 2004. It has made its name a stable hosting service around the world. Here are few major reasons to go for Hosting24 shared web hosting services. Good Uptime – The Company claims 99.99% uptime, They took care of their web hosting servers on a regular basis give the best uptime as per industry standard. Backup – Both web hosting package comes with weekly backup service which included in basic pricing. Means your data is saved once in every seven days. Support – The company provide 24-hour supports without any break for the complete year. You can contact support through chat & email both. CPANEL – Company is powered by Cpanel which is the most user-friendly control panel. You can manage your web hosting account with ease. Multiple Location – You have the choice to choose your data center from USA & EU. It is one of the biggest advantages for its users. Is Hosting24 is powerful enough to run your website? As per company claim you can run common type of websites without any issue. The hosting is sound enough to run static & dynamic website both. It gold package even allow running multiple websites together. As per our view, you can go for 12-month web hosting from hosting24. As the company has 30 days, money back commitments. So your investment is the safer end if you not like the service get your money back without any worry.